Walton Ford's Mvnera, 2018. Image courtesy of the artist and Kasmin; photography by Tom Powel Imaging. Are you in show preparation?I have left a lot of things to the last minute, which is fine. I’m finishing up the last two paintings now. I’ve done this so many times at this point and I usually do get some steam towards the end. I have more ideas than I have time to finish. It feels good and they’re watercolors which means it has to go quickly to look good anyway. They dry almost instantaneously. It means I’m just going to work pretty much solid till the end of the month and that’s okay. Without these deadlines, I probably wouldn’t get much done here. In the last three years, I’ve had one show after another which has propelled me to work more intensely then I have in a long time. Were the works that you made for these sequential shows related to one another?Yeah, they have been lately. This last show for Gagosian’s L.A. space was a thematic show about California. It’s such an amazing state for natural history that I wanted to explore. And one of the paintings I did for that show was a painting of the MGM Lion lounging by a sort of mid century swimming pool. I was interested in the breeding farms in LA that during the Hollywood era raised lions for circuses, Hollywood movies and zoos. Some of these magnificent lions resembled a type of lion called the Barbary lion, which is extinct in the wild. It was a lion that lived in the Atlas mountains in North Africa, and it was wiped out in its native habitat, but very popular for zoos because it had a really magnificent mane and all this belly hair. The MGM lion appears to be one of them. There’s dispute about that, but I don’t really care. A story is good enough reason for me to paint it. I felt it really stood out in the Gagosian show so I decided to do a show that was dedicated to the Barbary lion as a subject. This is how it happens. There’ll be some branch that’ll suddenly presented itself in my reading or research and I’ll want to explore it further. What does that research look like? For the show in LA, I was reading a lot of basic histories of the area but also about specific animals like the California grizzly bear or the condor because those animals were unique to the area but had a fraught relationship with the Western people. I do collect the imagery as well. I buy antique postcards and things like that. But also just download images from the computer, print them out. And I never paint directly from any photographic research. But I’ll have an image board kind of thing going. When you spoke about watercolor’s fast drying nature, does that mean you have to plan what you’re going to do before you begin?The more preparation I take the better it goes. When I was a student at Rhode Island School of design, I spent my senior year in Rome. My whole life changed over there. I saw frescoes like Giotto’s cycle at St Francis cathedral. The frescoes of tell his life in a comic strip form. They’re big life size figures. I thought I’d never seen anything so beautiful. Fresco is one of those unforgiving mediums where they needed to do very careful drawings first and transfer the drawings to the plaster while it is still wet. There’s very little room for error. I realized when started making sort of fake Audubon’s for my own amusement that I was attracted to this life-size scale. I wanted to make the viewer feel like the animal was in the room. I decided to apply fresco strategy. I made dozen of preparatory drawings in order to make something colossal. As my practice works now, I need do little watercolor studies just to establish what kind of washes and colors I’m going to use. By the time I get to the actual painting, the creative process is over and it becomes a kind of execution. Do you plan your exhibitions in the same careful way you plan your paintings? Yes, and for me it comes back to Giotto’s cathedral; it was the greatest art installation that I’ve ever seen. And obviously I’m still working with the white cube gallery system, but at the very least I can do is make something that hangs together that looks like it means something when you enter the space. 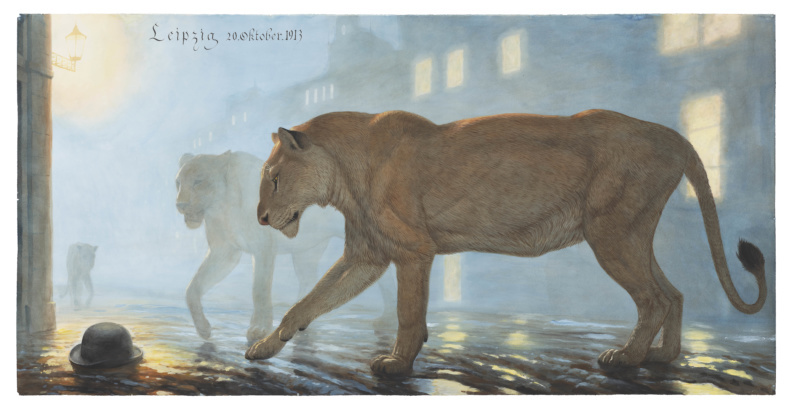 Walton Ford’s Leipzig 20 Oktober 1913, 2018. Image courtesy of the artist and Kasmin; photography by Tom Powel Imaging. I find your work concerned with both accuracy and the fantastic, so I am wondering if the current discussion surrounding truth and who writes history has changed the way you think about your practice. I think it’s effected me but not in a conscious way. I’m really interested in making unique objects that are impossible to reproduce or simulate the experience of being in the room with. The way that I paint is specific. If somebody hasn’t set foot in a gallery where I’ve actually put the things on the wall, then they really don’t have anything to say about my work. The presence of the unique object doesn’t reproduce. It’s also not true of all art. For example, maybe the best way to look at a Diane Arbus photograph is in a book. She was not a master printer and when Aperture made her book, they reprinted all our images at a much higher quality. Maybe in some ways that can be the primary source. And in regards to making my work specifically political, my feeling is that I want to create things that don’t even engage because that conversation seems to have so much bandwidth already. I’m really interested in narrowing in on more specific narratives like the Barbary lion and how it went extinct. What were the forces that led to that? That’s the kind of truth that is now being shoved aside, right? The greatest example of say living in your time is coming up with a fantastic metaphorical narrative image that is mysterious but also absolutely tells the truth about the situation on the ground. It’s such a funny, tricky place to be and hard to achieve and I’m not ever saying that I’ve come close to someone like Goya who was able to do with that. Emily Dickinson said a very similar thing. She wrote: “tell the truth, but tell it slant success in circuit lies.”There you go. Of course maybe it’s just a interesting cop out. I think of the work of Sue Coe. She would make a painting of a slaughter house, and all the animals are really weeping and all the butchers are villains and the blood is everywhere. There’s no nuance. She’s just saying meat is murder and that’s what you’re going to get from this image and there is no other interpretation available and there was something really ballsy about her doing that. I guess by being oblique and artistic you copping out on just saying what’s really, in front of you, but I still find I’m more drawn to subtleties. I try to make nuanced work of which I got called out for early in my career by Peter Schjeldahl, which was great. He said when I brought humor and nuance into my images, he liked it a lot, but I lost it when it became too obvious. It was a really good criticism even though it appeared in the Village Voice in front of everybody.